Kiefer Sutherland and Robert Carlyle star in this explosive war film based on an amazing true story. Captured by the Japanese, a group of courageous soldiers are forced to build the infamous "Railway Of Death" between Thailand and Burma during the height of WWII. But the most intense battles come from within as each prisoner must face his own personal struggle for freedom, survival and hope in the face of inhumanity. 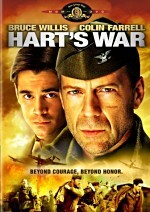 As regular as the tides, whenever Memorial Day approaches, studios trot out DVDs that feature World War II related content. It doesn’t hurt that these flicks usually follow a “manly” path that makes them appropriate candidates for Father’s Day presents, a holiday that follows Memorial Day by only a few weeks. It seems like many of these focus on older films like The Battle of Britain or The Enemy Below, but occasionally we find more recent efforts. Into the latter category falls 2001’s To End All Wars, a flick that never received a theatrical run in the US and that only now makes its debut on DVD here. At the film’s start, we meet the Argylls, a squad of Scottish enlistees who go to fight in World War II. We encounter our narrator, Captain Ernest Gordon (Ciaran McMenamin), as well as commanding officer Lieutenant Colonel Stuart McLean (James Cosmo) and second in command Major Ian Campbell (Robert Carlyle). Quickly we see our lads captured by the Japanese as the film jumps to the coast of Thailand after the fall of Singapore on February 17, 1942. In addition to the Scots, the prisoners include Merchant Marine Lt. Jim Reardon (Kiefer Sutherland). A large group gets taken to Camp Kanchanaburi, Thailand, where the Japanese jailers abuse them. In this setting, fellow inmate Dusty Miller (Mark Strong) helps Gordon and shows him the ropes in the camp. All attempt to acclimate to the primitive and basic setting. Campbell investigates a way to escape, but since the camp sits in the middle of nowhere, it becomes more difficult. The Japanese force them to follow many of their customs. Lt. Colonel Nagatomo (Shu Nakajima), Chief of Thailand POW Administration, comes to inspect the prisoners and tells them they’ll build the Thailand-Burma Railway. It will run 420 km and they need to finish it in 18 months. The Japanese murder McLean when he stands up to them, which affects Campbell’s escape plans. Reardon chooses to look out for number one, though, and goes ahead with it on his own. Construction starts on October 28, 1942, as the Japanese need the railway to invade India. Gordon gets sick and almost dies, which makes him give up hope. However, the men entreat Gordon to act as a camp teacher, so he sets up a popular “Jungle University” that recruits other volunteers as teachers and inspires hope. In addition, Campbell starts his own secret plan, as he’s intent on “justice” for the killing of McLean. The rest of the movie follows actions in the camp and the progress of the railway. We watch the different tensions and issues that erupt. I liked Wars the first time when it was called The Bridge On the River Kwai. Perhaps that comment isn’t fair, for the two stories aren’t duplicates, but they share enough in common to make one definitely recall the older classic as Wars runs. As I took notes on Wars, the word “cheap” dominated. I didn’t intend it to connote that the film looked inexpensive or crudely made. Indeed, it presented surprisingly strong production values for an effort that likely boasted a fairly small budget. I saw the cheap use of narration to provide easy exposition. Films should show rather than tell, but Wars offers one talky mother. I heard cheap attempts at poetry via bad lines like “We heard the true spirit of the music, and that was pure freedom”. In the case of Wars, “cheap” means “easy”, and the film usually comes across as tepid and without much new to say. Really, it all comes to yet another “triumph of the human spirit” films, though it comes down mainly to a battle between revenge and forgiveness. The movie’s not bold enough to let the former win, of course, as it prefers to be a kinder, gentler experience in which we learn all the usual lessons. Not that there’s anything wrong with those lessons, but they mean that Wars doesn’t serve much purpose. Taken from a true story, it comes across as mostly fictionalized. Even events that stem from reality feel fake, as the movie doesn’t work in a believable way. Instead, it prefers to concentrate on its theories and not bother with a coherent view of the situation. Expect lots of Biblical allusions and little else. It doesn’t help that this character-centered film presents rather limited personality. We can break down the participants into little more than generic stereotypes, with more than a slight Platoon vibe to the conflicts suffered by Gordon. Miller comes across as the Willem Dafoe role, while Campbell takes on the Tom Berenger side. Neither of them makes more than a bland impact. Ultimately, I just felt like I’d seen it all. To End All Wars comes across as generally flat and predictable, and nothing about it spices things up enough to overcome those elements. Some potential lurks beneath the surface, but the movie doesn’t explore the pieces well enough to pack a punch. 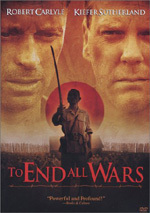 To End All Wars appears in both an aspect ratio of approximately 1.85:1 and in a fullscreen version on this double-sided DVD-14; the widescreen image has been enhanced for 16X9 televisions. Only the letterboxed picture was reviewed for this article. Overall, the movie looked pretty terrific. Sharpness rarely varied. The movie almost uniformly seemed concise and well defined. Virtually no examples of softness marred the presentation, which was nicely detailed. No jagged edges or shimmering popped up, and only some light edge enhancement occasionally appeared. Print flaws seemed absent, as I noticed no signs of specks, marks or other defects. 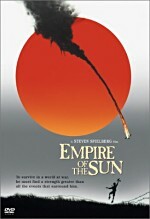 As one might expect from a film set in an Asian prison camp, the palette of Wars remained fairly monochromatic. Khaki tans dominated the flick, as it depicted an arid and drab locale. Jungle shots also featured low-key greens. The colors seemed appropriately rendered for this kind of movie and were clean and smooth. Blacks also came across as deep and firm, while low-light shots demonstrated acceptable opacity and good clarity. I’d like to lose the marginal edge enhancement, but this remained a strong transfer nonetheless. While not quite as strong as the visuals, the Dolby Digital 5.1 soundtrack of To End All Wars also fared well. Because so much of the movie took place in the relative quiet of a prison camp, the mix mostly emphasized general ambience. However, the war setting occasionally offered good opportunity for greater breadth within the spectrum. The period battle elements provided nice bombast, while vehicles panned neatly across the speakers. The whole thing provided solid localization and placement as well as clean stereo imaging for the music. The surrounds kicked in largely when the action required it and did so well. Otherwise they helped reinforce the feeling of environment in a natural and unobtrusive manner. Although I often found it tough to understand the many thick Scottish accents heard in Wars, I can’t blame the quality of the recording for that. Instead, all dialogue sounded nicely natural and warm, with no signs of edginess or other defects. Music remained fairly subdued but seemed smooth and clearly rendered, and effects followed suit. Those elements consistently came across as accurate and appropriately dynamic. Given the low-key setting of the prison camp, the effects didn’t often tax my system, but louder moments like warfare and trains seemed very clean and crisp. Low-end was deep and rich, with no boomy or distorted elements. The soundfield lacked the breadth to hit “A”-level, but Wars nonetheless earned a solid “B+” and fit the film well. A few extras round out the DVD. We start with an audio commentary from director David L. Cunningham, who offers a running, screen-specific discussion. Cunningham gets into a decent mix of topics but fails to make this a tremendously engaging track. He chats about locations, the facts behind the story, casting and working with the actors, challenges of the low budget and the film’s long path to the screen, deleted scenes and changes made to avoid excessive graphics material, various aspects of the shoot, and photographic techniques and the movie’s look. He tosses in lots of praise and comments about what troupers the actors were. On the positive side, Cunningham seems to become more involved in the track as it progresses, so the film’s second half offers a greater level of depth than does the first. He produces a reasonably informative chat but not a great one. In addition to the trailer for Hangman’s Curse, we find a documentary. It runs 29 minutes and 55 seconds as it presents movie clips, behind the scenes shots, and interviews. We get remarks from director Cunningham, producer Jack Hafer, screenwriter Brian Godawa, production designer Paul Sylbert, extras coordinator Ben Huddleston, and actors Kiefer Sutherland, Ciaran McMenamin, Robert Carlyle, Hideo Nakajima, Mark Strong, Yugo Saso, Masayuki Yui, Sakae Kimura, John Gregg and James Cosmo. In the program, we hear about background of the story and the history, trying to depict the tale respectfully and accurately, themes and character issues, Cunningham’s approach to the material, locations and sets, production design elements, coordinating extras, the shots of the real participants at the end, and the multinational cast. Not quite a promotional puff piece but not a terribly involving piece, the documentary gives us a decent look at the flick. It goes through the various topics reasonably well but fails to become anything more than that. We do hear a fair amount of praise for the tale and the participants, but those elements don’t dominate. Not surprisingly, the behind the scenes elements present the best parts of the show, especially when we see the involvement of the extras. Ultimately, the documentary includes some good material but fails to turn into anything special. The same goes for the disappointing To End All Wars. The movie tells a compelling tale but it does so in a lifeless and dull manner. It fails to exploit the natural drama and just feels like yet another flick with too much artificial sentiment. 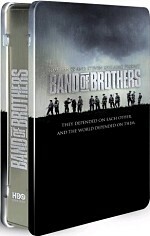 The DVD offers very strong picture and audio plus a decent collection of extras. I’d like to recommend the movie but it lacks the depth and clarity to become something worth your attention.